Following up from my last post, this was the view uptown from my apt. building that Hurricane Sandy left us with for 4 nights after our power went out last week. The lit skyline in the distance almost felt like it was of a different land rather than the same city. I had a similar feeling as we rode the bus home from midtown and it crossed over 39th Street from business as usual to pitch black and a hush would fall over the entire bus. On Thursday night we were deposited on 23rd Street by our bus driver and informed that he could go no further as it was too dark and deemed dangerous. We thought about hailing a cab but it was only 6:20 so we decided to make our way home by foot. We've done this over 30 block walk many times but never in darkness without the aid of traffic lights. It was a little scary but there were flares set up along the avenue and crossing guards posted at major intersections. The irony was that much of our journey was lit by passing buses going into Brooklyn on the very same route that our downtown bus would've taken and it wasn't too dangerous for them. Let's just say that I was a little fired up at the MTA that evening. Our walk didn't end there as we live on the 10th floor. Going up 10 flights generally wasn't all that bad even though I'm not as fit as when I used to do it everyday but it was killer after our long "stroll". The absolute darkness of the stairwell was seriously eerie though. I always had to listen carefully for people coming for fear that I might scream if someone came up suddenly. 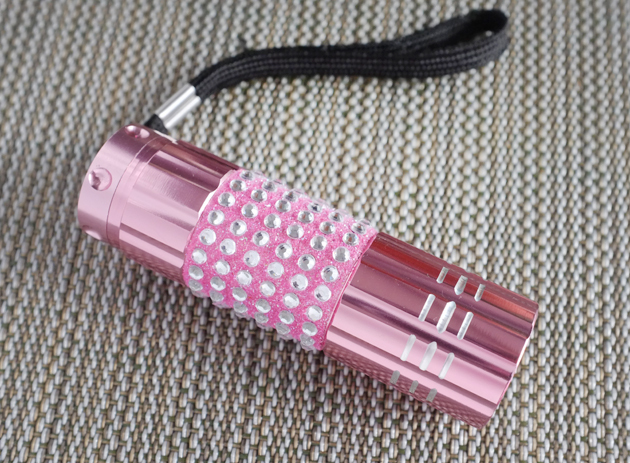 My trusty little flashlight helped alot. Isn't it fabulous? Our power and water was restored on Friday night. The steam service below 14th Street is out so we're still without heat and hot water and there's another storm coming tomorrow. Still after last week, this is nothing and I feel like one of the lucky ones. Sadly there are those who are less fortunate. The Red Cross needs both blood and financial donations. Donations help the Red Cross provide shelter, food, emotional support and other assistance to those affected by disasters like Hurricane Sandy. To donate, you can visit www.redcross.org, call 1-800-RED-CROSS or simply text the word 'REDCROSS' to 90999 to make a $10 donation. I took this photo after the electricity returned which is more what we're used to seeing. This week's New York magazine features a shot of the city from above post power outage that's just stunning. Thanks to everyone for your kind words and support! I'm still operating on a different routine at the moment so please bear with me as I try to catch up with you all. For my friends in the US, don't forget to get out and exercise your right to vote today! 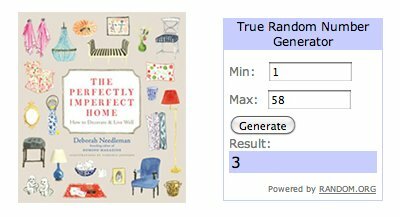 The winner of the Blogiversary Giveaway is Anna of IHOD. Congratulations Anna! I'll be sending you an email later today. I can't get over these photos without the power and even with it doesn't seem like the real NYC that you see in movies/on tv! I hope you're doing ok, it must be really tough for everyone too. Naviagting the dark in style...I like it! Good to hear you are doing well. Hi Rowena, I feel so lucky to have heard a real life Sandy experience...its what people say individually that matters, not the mass stories in the news. It sounds like a terrifying and daunting time, I commend you all for getting through it so calmly and without much of the negativity. I can only hope and pray for the quick recovery from all the damage. Hang in there! This IS just crazy.. the darkness, it does look like a different place when there is no life or light doesn't it? I'm so glad things are getting better and I will continue to pray for a quick recovery. 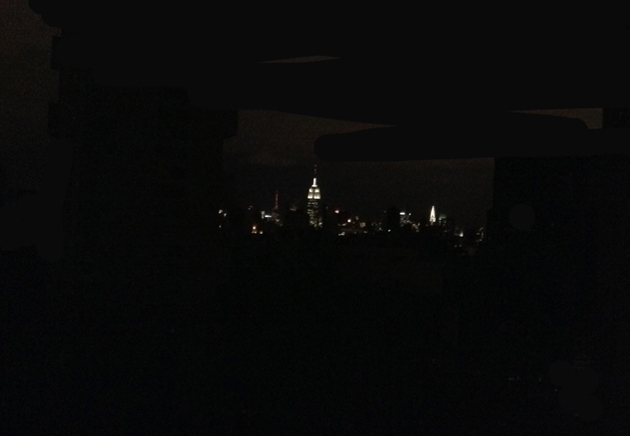 It's incredible to see New York without power...The powerhouse city of the country without any electricity gives a really spooky feeling to the place. Glad to hear that you're fine now though! Man, what an experience! I really hope you get hot water and heat back soon. I don't know whether or not you would be interested in going to Unique NY, but I will be going to that next weekend. If you have the energy to meet, I am around as well. 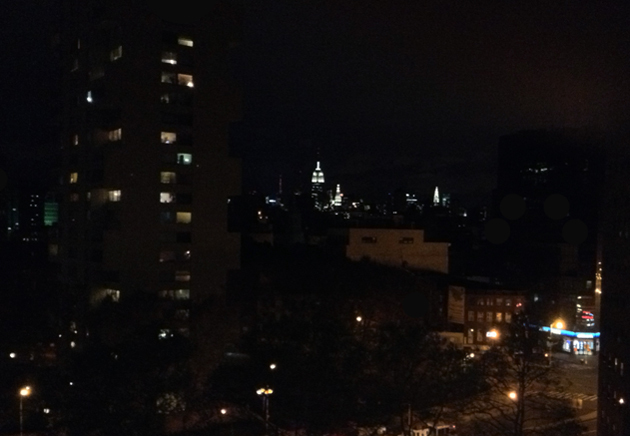 To see New York without power, it's an incredible experience! I'm very glad things are getting better. This picture is crazy. So glad that you stayed safe from the storm. Glad they restored your power and water back. It is hard to believe what a hurricane can do to damage. Glad to hear you are doing okay Rowena. Most of us often dont realize how lucky we are to have a roof over our head, clean clothes, food, electricity, water until we dont have them. I was so elated when we got the power back after hurricane. Hi dear, thanks so much for your insight. We're actually having major power surge problems where I live, we've not had any for more than 12 hours today and its been on and off the past few days. Its been terribly difficult and frustrating, especially at night, so I can only imagine how much worse it must've been for all of you there in NYC. Oh Rowena, this is such an otherworldly picture! I can't believe how much you Americans have gone through! I'm so glad to know that things are coming back together slowly, but surely! I keep my fingers for you, I know that New York is so resilient and incredibly strong! It's amazing everything going on there... Hope you're doing we'll my dear! Thanks for sharing your experience. It's amazing how many millions of people were affected by Sandy. I'm glad your ok and things are going back to normal! That sounds like quite an adventure. It's too bad you couldn't have hopped on one of the Brooklyn bound buses. I totally agree about the screaming if you didn't hear or see someone coming. Hopefully in a month or so, after you have had your heat and power back for a while, you will have a lot of good stories to tell. It's good you had places to go that had power and heat and I hope everything has been restored for you by now, it's been very cold the last few days. Rowena, I'm glad you're okay and really hope things get better soon and that you are staying warm and have your heat back! Sending you lots of good thoughts and really hope that everything is back to normal for you!